HomeFootwearWhat are the Most Comfortable Women’s Sneakers? What are the Most Comfortable Women’s Sneakers? Sneakers are possibly one of the greatest fashion items ever invented if you are a woman who cares about being comfortable. The advanced fabric, and support technology that is used on today’s designs make them better than ever and a wardrobe essential for all women. You can get styles in any color in a multitude of fabrics from mesh to wool that is all designed with one this in mind, comfort. Whether you are looking for a fashion sneaker to wear while walking around all day, or you need a stylish shoe for travel or work, we have rounded up the most popular sneakers that are both comfortable and cute. 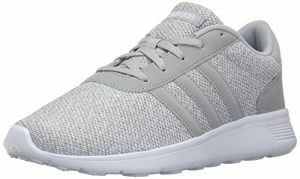 Adidas’s NEO Women’s Lite Racer Casual Sneakers are a very light and extremely comfortable shoe that works well for people who have to be on their feet for long periods. They have pretty decent arch support and contain somethings called a cloudfoam sock liner that provides a lot of cushioning and adds to the comfort level. They come in a variety of vibrant colors and stretchy materials. Most of the styles have breathable upper fabric, which is especially useful if your feet tend to overheat. They are lightweight and easy to clean, so they are a great shoe for traveling, as they won’t be too heavy in your suitcase. 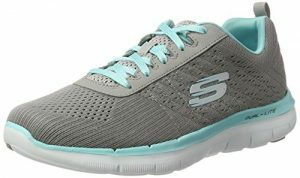 This style from Sketchers is another excellent option for anyone who is on their feet all day and need something easy to walk in, and that won’t leave your feet feeling sore by the end of the day. 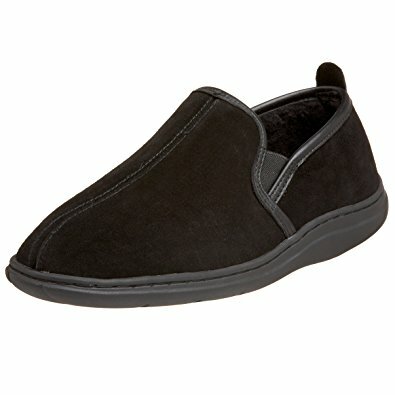 Skechers are known for their memory foam lines of shoes that are wonderfully comfortable and lightweight. This particular style won’t feel too hot because the fabric lets allows your feet to breath. They look great with shorts, jeans, or workout wear, and you can usually get them for a pretty reasonable price. If you are able to get the sizing right, the Adidas Superstar will be one of the most comfortable sneakers that you own. They tend to run a bit large, so check your sizing carefully. They are pretty stylish and trendy, so you can get away with wearing them with almost anything (skirts, dresses, jeans etc.). As far as comfort goes, they are quite padded with pretty good arch support. 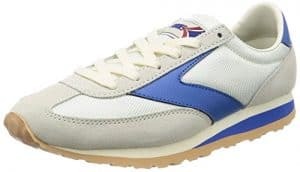 They are one of the more durable sneakers around, since they are made of leather and synthetic material on the upper part of the shoe, and have a thick rubber sole. Sometimes the super durable styles can be uncomfortably warm, but the Superstar does have a breathable mesh liner that can help prevent your feet from getting too hot and sweaty. The Superstar is available in a number of different color combos (mostly white with different colors of stripes, although you can get black as well as a few other colors). If you love the look of classic Converse All Stars but find them a tad uncomfortable to wear, these Shoreline Slip Casual Shoe are a great alternative. Not only are they more comfortable than regular converse, but they are also a little bit cuter. 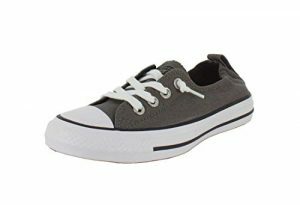 Most women buy the unisex Converse, which is an excellent shoe; however if you have larger sized feet, they can sometimes make your feet look even bigger than they are. This style has the same great look but is not as bulky as the traditional Converse because they have a little bit of a different fit. The key to the more comfortable and feminine looking Shoreline style is that it has a stretchy back which helps prevent blisters and it is slip on with no tie laces. I don’t find Keds all that comfortable, but, if you have long narrow feet, you will probably find Keds to be very comfortable. The Women’s Champion Original Canvas Sneaker is the classic Keds basic shoe, that hasn’t changed much for decades. They come in a lot of beautiful colors and cool patterns so that they can add a lot to an outfit. One of the best things about this style is the price; you get a decent shoe for not a lot of money. They also come in multiple widths, which is sometimes hard to find in an affordable sneaker. The soles are a little thin, but for most situations that shouldn’t present much of a problem. Overall they are a great casual, classic shoe that is versatile enough you can wear them with lots of different outfits. 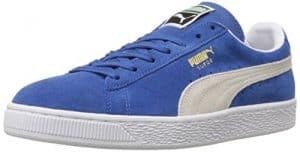 A personal favorite of mine, the PUMA Suede Classic Shoe is more comfortable than any other sneaker that I own. If you have high arches and a very wide foot, they may not be the best choice for you, since the shoe is very flat and can run a little narrow. I like the black or dark blue colors, but there are some pretty nice vibrant colors in this style. Since they are suede, they can sometimes be a little hard to clean, and aren’t the best if it is wet outside. 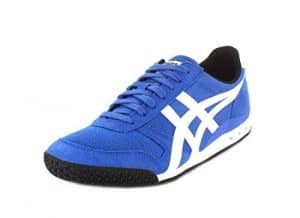 If you want something a little different, yet super stylish, check out the Onitsuka Tiger Ultimate 81 Fashion Sneaker. They have a low profile silhouette and are very sleek, so they don’t have the bulk to them that you sometimes get with other brands. Despite being super lightweight, they manage to stay supportive with a little bit of cushioning on the sole. The upper material is a nylon/mesh, so they are breathable and fine to wear in hot weather. This shoe isn’t for everyone, they fit best on a regular or narrow foot with a lower arch. You aren’t going to want to wear these shoes for long distances or working out, but they work well as a casual sneaker for basic everyday wear. They come in a bunch of nice, bold color combos, that are very stylish. This is a unisex style so be careful with sizing. 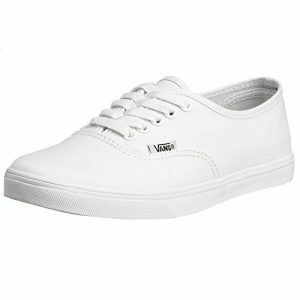 Vans Authentic Lo Pro are kind of similar to the Keds Classic style listed above. They are a simple low top, lace-up with a thin silhouette. As with most Vans, they are pretty comfortable, durable, and this particular style is quite versatile because of the classic design. You can dress them up or down, and you can buy them in a number of really great colors. The Brooks Vanguard isn’t quite as famous as some of the other styles on our list, but they are a great shoe. The Vanguards are a little retro looking with their low profile styling and unique color combinations. You can wear them with dresses, jeans, and shorts and they will look adorable. They kind of look like running shoes, but aren’t intended to be anything other than a comfortable sneaker. 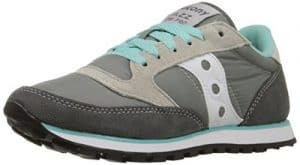 Saucony makes some pretty nice running shoes, so it isn’t a surprise that their sneakers are also great. 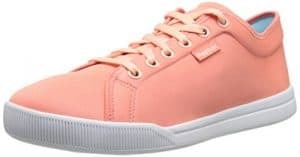 Their Originals Women’s Jazz Low Pro Sneaker is a pretty cool, retro looking, slim fitting style that makes a good everyday sneaker. It is reported to be comfortable right from the get go without having to break them in. They also apparently have a decent amount of arch support despite being very lightweight. They have a little more traction on the sole of the shoe than some of the other casual sneakers in this post (I’m looking at you Keds). Often recommended as a good travel walking shoe that isn’t a running shoe, the Reebok Women’s Skyscape Runaround 2.0 Walking Shoe are known for being crazy comfortable and super lightweight. There isn’t a lot of arch support in this style, so if you have high arches and you are interested in this style, you may need an insert. Despite a lack of arch support, they do have a thick cushioned sole that helps to make them a dream to wear. They also have a very classic style to them, so you can add them to a lot of casual outfits. You may not be able to see it in the picture, but the material is a little shiny and stretchy (kind of like neoprene, almost water shoe like). People love this style for travel because they are so light, they don’t add a lot of weight to your luggage. A brand that is getting a lot of attention lately is Allbirds. 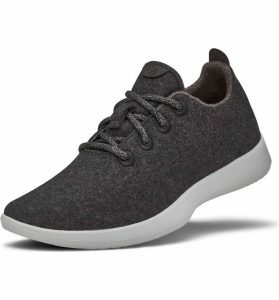 Their Allbirds Wool Runner is reportedly extremely comfortable, and since it is made of merino wool, you can even wear it without socks. Not something I’m looking for in a sneaker, but apparently, a lot of people hate wearing socks with their shoes. Anyway, the features that add to the comfort level are a lightweight, low-density foam cushioning in the footbed and the temperature regulating and moisture wicking properties of the wool. Shopping for a great sneaker is pretty straightforward. Most people want something that looks good, is comfortable and doesn’t cost a fortune. Here are a few other things to consider before you make your purchase. Sizing– Sizing isn’t standard across different brands, so you need to try any shoes on that you are thinking of getting. If you are buying online, check sizing charts and reviews to see whether they fit big or small. Also, be aware that some sneakers are unisex sizing, so you will have to double check sizing for men or women. Also don’t forget to check to size for narrow, regular or wide feet, as some brands do offer different widths. Material– The best sneakers come in a wide variety of materials: leather, suede, synthetics, nylon mesh, canvas etc.. What will work best for you obviously depends on when you are planning on wearing your shoes. Leather, suede and some synthetics can make your feet feel pretty warm, which is great for colder seasons and not so great in the summer. Nylon mesh and some of the other types of breathable synthetics are fantastic for the summer months, or if you generally have very warm feet. Colors– Luckily there is no shortage of different color options for casual walking sneakers. Many of the options on our list have all of the primary colors you will need, plus very vibrant cool patterns if you want something a little more exciting. 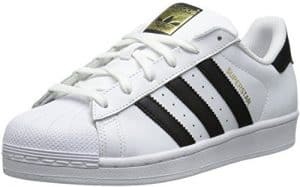 If you tend to have trouble keeping your shoes clean, you may want to avoid white shoes or at least look into the white shoes that are easy to clean like the Adidas Superstars. Breathable– If your feet get hot, you may want to look for the mesh type material that allows your feet to breath. Conversely, if you have cold feet, you may want to consider suede or some of the heavier material like leather or canvas. Silhouette – Some of the most popular styles can be a little bulky and may not fit in the way that you are expecting. If you like a slim, clean silhouette that goes well with skinny jeans, you may want to avoid the more bulky shoes like the Adidas Superstar, the Puma Classics, or the Brooks Vanguard and stick with the Keds or the Vans styles. Easy to clean – White sneakers are very popular at the moment, but they can sometimes be a little difficult to keep clean. If you live somewhere where it rains a lot and you want a white sneaker, you may want to consider getting leather type one like the Adidas Stan Smith that can be wiped clean.